On Wednesday, August 8th 2018, H.E. 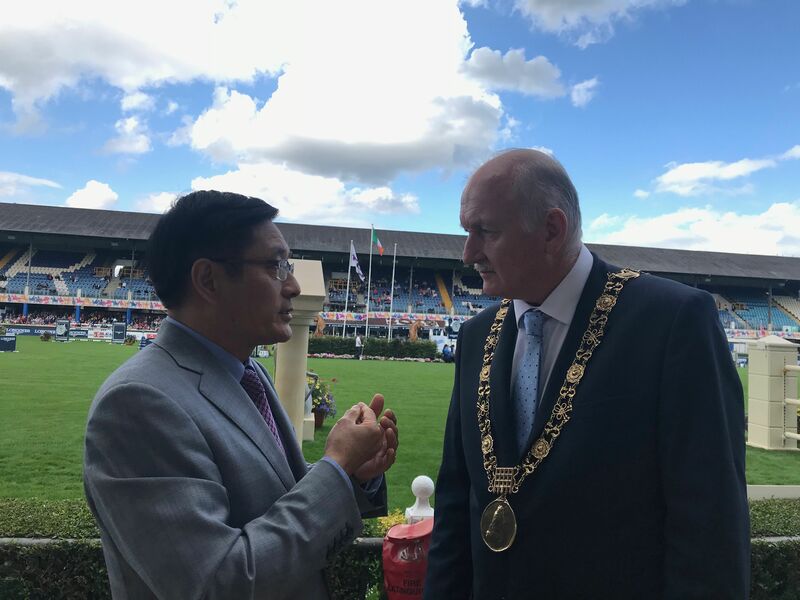 Dr. Yue Xiaoyong, Chinese Ambassador to Ireland, met with Cllr. Nial Ring, Lord Mayor of Dublin during his visit to the Dublin Horse Show. They exchanged views on the development of bilateral relations and local cooperation in a good atmosphere. Both expressed their willingness to jointly enhance the friendly relationship between Chinese local governments and Dublin city, create greater benefit to the two peoples and add more impetus to the bilateral relations between China and Ireland. Also present were Ms. Yang Hua, Political Counsellor and Ms. Xue He, Commercial Counsellor from the Chinese Embassy.